April 3, 2019: When the next provincial government takes office, it must take immediate and decisive action to address the overdose epidemic claiming two Albertans’ lives every day. 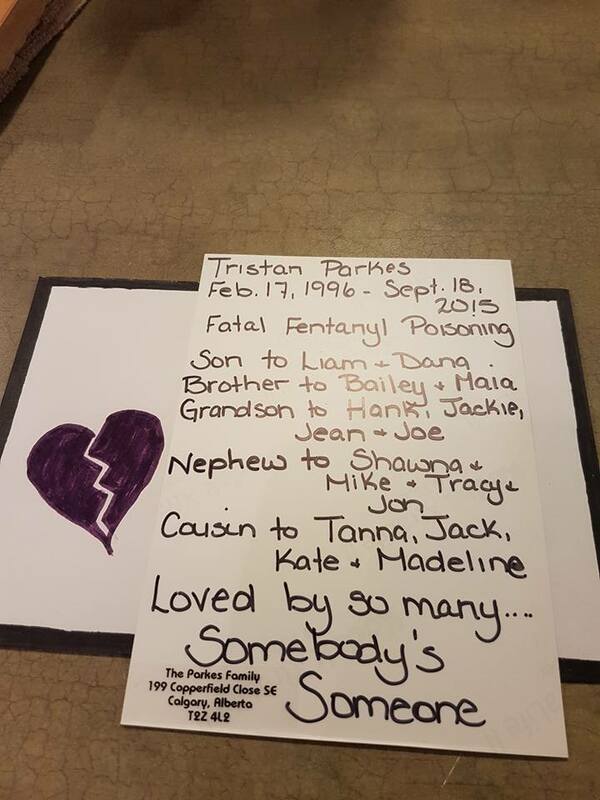 While this pace of preventable death seems to some like a new normal, each loss rocks families, friends and communities and takes an unforgiving toll on Alberta’s economy. Addressing this unprecedented public health emergency must be a priority for our next Premier. Two Alberta-based community groups – Change the Face of Addiction and Moms Stop The Harm – invited all provincial party leaders to complete a brief online questionnaire. 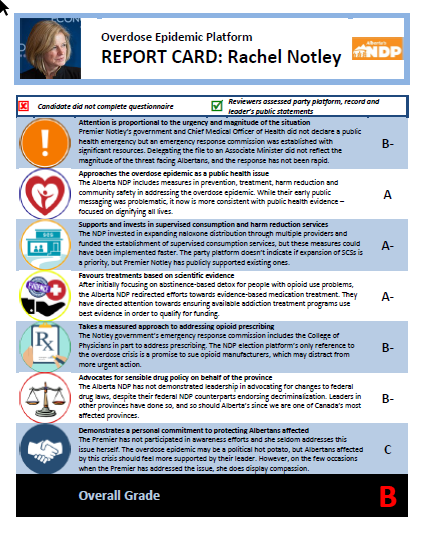 The questionnaire contained four questions about leaders’ proposals across what are described as the “four pillars” of substance use policy: prevention, treatment, enforcement, and harm reduction. We also assessed the extent to which leaders have demonstrated a personal commitment to protecting all Albertans affected. As of April 2, 2019, only David Khan of the Alberta Liberal Party responded directly. We therefore collected the remaining leaders’ available policy documents, public announcements and commentary. With the assistance of provincial content area experts acting as concerned citizens, we graded each leader’s approach. This exercise leaves us deeply concerned. Most leaders do not describe action that is proportional to the magnitude and urgency of this crisis, and some leaders endorse policy directions that are more likely to harm than help. For example, increasing drug investigation and enforcement may be politically appealing, but evidence shows these measures increase stigma, exacerbate social inequities and discrimination, and increase harms of substance use. In the meantime, the threat of punishment does little if anything to prevent substance use, and it increases violence in the drug trade. Some leaders propose addiction treatments that research has proven relatively ineffective for opioid addiction. For example, mandatory detox services, abstinence-based residential programs, and “faith-based” treatment approaches do not achieve optimal health results. In some cases, candidates endorsed interventions that could increase the risk of overdose death. Besides being ineffective, some of the suggested treatments could not be scaled to the extent required to meet population demand. While more money for treatment is desperately needed, we need to invest in treatments that are shown to work. At least equally concerning is some leaders’ view that life-saving harm reduction services that have finally been established in Alberta should meet additional bureaucratic requirements that would at least delay their expansion if not cause their closure. Having reviewed party leaders’ positions, we fear – as do public health experts nationwide – that the progress made towards evidence-based services like supervised consumption could be undone following this month’s election. Albertans should expect that in a public health emergency, our leaders will perform at an A-plus level, acting rapidly, resolutely, and consistently with the best available evidence to protect human life. This issue requires critical attention in the lead up to the election, and it appears our Premier-hopefuls have some schooling to do before April 16th. Background: Change the Face of Addiction and Moms Stop The Harm are two Alberta-based community groups made up of citizens who became advocates after they witnessed the lack of supports and services for family members experiencing addiction. Many members of these organizations have had loved ones die from overdose. February 4th will mark five years since my son Jordan passed away from an overdose of prescription drugs. I miss him as much today as I have done on any day over these years. Jordan was a person who cared deeply about family, friends, and animals. He did not have time to really develop a philosophy about his life in the world. Youth and addiction can do that to a person. While he knew deep love, he missed out on marriage, children (he loved kids! ), growing wisdom and the joy we experience in the world of the living. 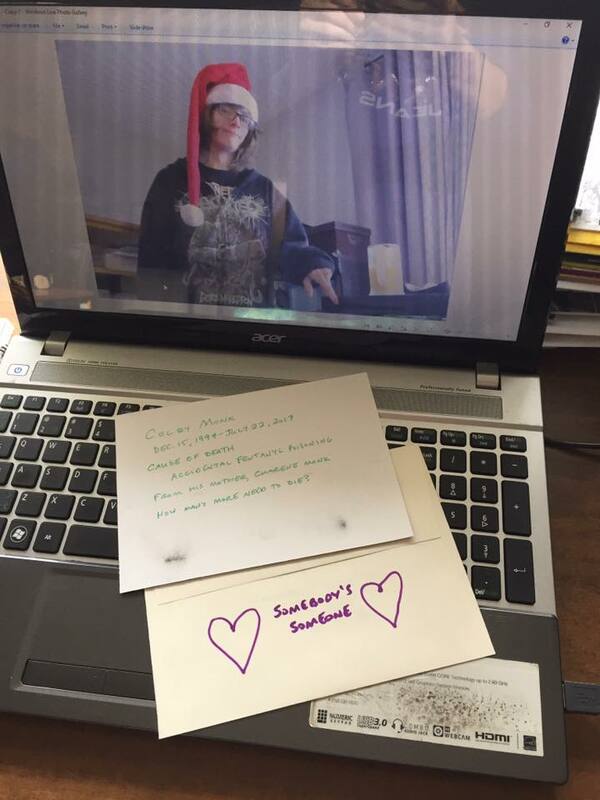 He is remembered with love by his friends and his family. We knew him as funny, over-the-top, risk taking, caring, skilled, and smart. But as a person involved in drugs, he was often anxious, scared, rude, irresponsible. Addiction does that to a person. It did not come from within the beautiful soul of Jordan. You may be surprised that I include Jordan’s addiction in this piece as it was only a small part of who he was. But that is what took him away. My life’s work now is to support the lives of people who use drugs, families with a loved one using drugs, and to advocate for more compassionate, evidence-based drug policies. No one should lose a child. Senseless, accidental and preventable drug deaths must end. The stigma around drug addiction must end. No one should suffer needlessly from drug harms. Jordan brought love and joy to my world for 25 years, and for that I will be forever grateful. In Jordan’s memory I ask that everyone educate themselves on the nature of addiction and the treatments for it. I watched beautiful boy 2 nights ago. It seemed disjointed and somewhat superficial and impersonal. It’s as though this family was swept into a terrifying journey through their son’s addiction and then the storm ended and that was it. It’s an experiential story that seems to lack the reflections and insights I was craving as the mother of a person who suffered from addiction. There is no moral to this story, no lessons or pearls of knowledge, nothing to educate us. In fact, the message of this story seems to convey that everyone but the person with addiction is a victim with no choices, and only a person suffering from addiction can help themselves. Worse, it seems to suggest that being addicted to substances were a choice. Neuroscience tells us otherwise. With great actors and a timely and socially relevant theme, I think the implied promise of this film is misleading/disappointing and I give it 2 thumbs down. Just this week, the Government of Canada legalized cannabis.This is a welcome, positive, and long-overdue step. In listening over the past year to the discussion and debate about the pros and cons of legalizing marijuana, it is apparent to me that the arguments in favour of this measure are overwhelming: it helps with harm reduction; it eliminates the criminal element; it provides safety of product; it protects children and vulnerable Canadians; it unclogs our criminal justice system to deal with real crime; it treats addiction and substance use as a health issue, not a criminal or moral one. However, it is patently obvious that the arguments in favour of cannabis legalization can be applied with equal force to all drugs. In fact, because other drugs do and have the capacity to cause death, I think the arguments are even stronger for legalizing and properly regulating all drugs. But this is not just a theoretical position – fortunately, we have real examples and hard evidence to back it up. In 1999, there was a drug crisis in Portugal. Use of hard drugs was rampant and approximately one per cent of their population reported a drug addiction. So in 2001, Portugal decided to treat the possession and use of small quantities of drugs as a public health issue, not a criminal one. They decriminalized the use of all drugs, even heroin and cocaine, and unleashed a major public health campaign to tackle addiction. Though possession is still legally prohibited, violations are treated as administrative infractions and removed completely from the criminal realm. That means getting caught using or possessing drugs could result in a small fine or a referral to treatment where appropriate, but not jail time or a criminal record. The crisis in Portugal soon stabilized, and the ensuing years saw dramatic drops in problematic drug use, HIV and hepatitis infection rates, overdose deaths, drug-related crime and incarceration rates. Portugal’s mortality rate from drugs is now four times lower than the European average, the number of teenagers who have experimented with drugs has fallen, and the number of people in treatment has increased. 90 percent of public money spent fighting drugs is now channeled toward health-care goals — just 10 per cent is spent on enforcement. In contrast, in Canada, 70 percent of funding spent combating drug use is spent on enforcement. We have the second highest rates of cannabis use among young people in the world and an opioid overdose crisis that is staggering. 4,000 Canadians lost their lives to overdoses in 2017, up from 3,000 in 2016. We're on track in 2018 to exceed that death toll, with as many as 6,000 Canadians dying from overdoses. 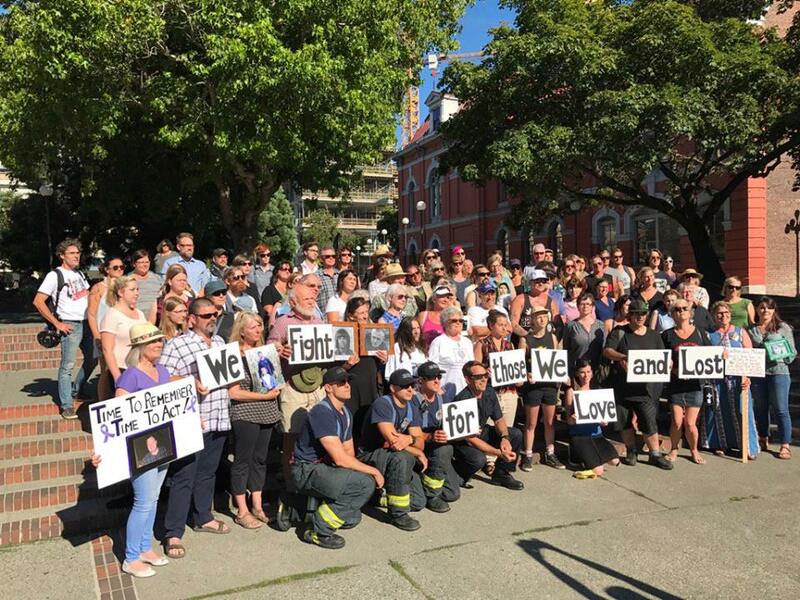 In British Columbia, overdose deaths spiked this March, marking the province's second-highest monthly total in history according to the BC Coroner’s Service. At the Liberal Party's recent policy convention, delegates voted overwhelmingly to adopt Jagmeet Singh and the NDP’s position on decriminalization and medical regulation as a means of responding to drug overdose deaths. However, both the Liberal Minister of Health and the Prime Minister responded by unequivocally ruling out action. Here’s what Liberal Health Minister Petipas-Taylor said this week when confronted with the fact that 4000 Canadians - a new record - died last year from overdoses: “By decriminalizing drugs, we’re certainly not going to fix the problem that’s on the streets right now,” she said. 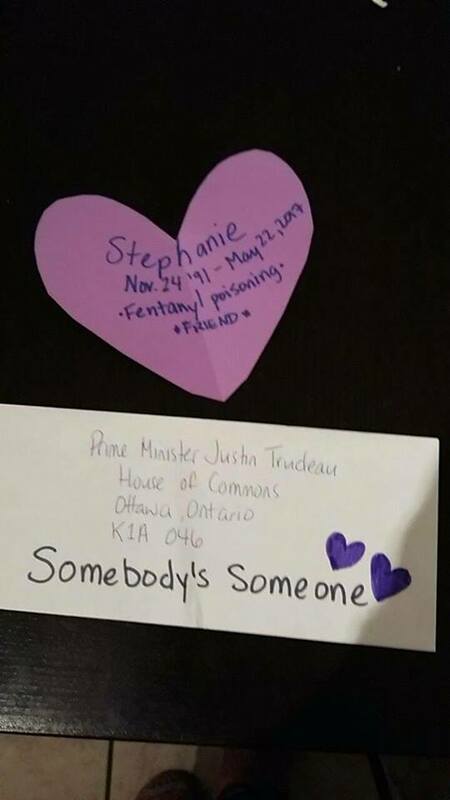 Instead, she pointed out that in May, Ottawa announced that opioids dispensed in Canada will soon have to carry stickers that warn the drugs can cause dependence, addiction and overdoses. Talk about ignoring the evidence. Talk about fiddling while Rome burns. The Liberal government has also refused to launch an investigation or initiate legal action to recover damages from opioid manufacturers for the tragic consequences and public costs of this crisis. Instead, federal government has left victims to seek their own recourse through a private class-action lawsuit. This resulted in a proposed settlement of only $20 million, with a paltry $2 million allocated to all provincial and federal health authorities in Canada. Thankfully, this settlement was rejected because no steps were taken to ensure that past and potential future public health care costs were identified. Imagine - we have experienced over 10,000 deaths and spent over a billion dollars in public health costs from opioids - and yet our federal government has not so much as launched an investigation into opioid manufacturer practices who themselves have earned billions of dollars in profits from these dangerous and highly addictive products. This stands in contrast to aggressive action from U.S. authorities, which has led to almost $700 million in damages and criminal convictions of opioid manufacturer executives for improper marketing - with many more lawsuits pending in their courts. 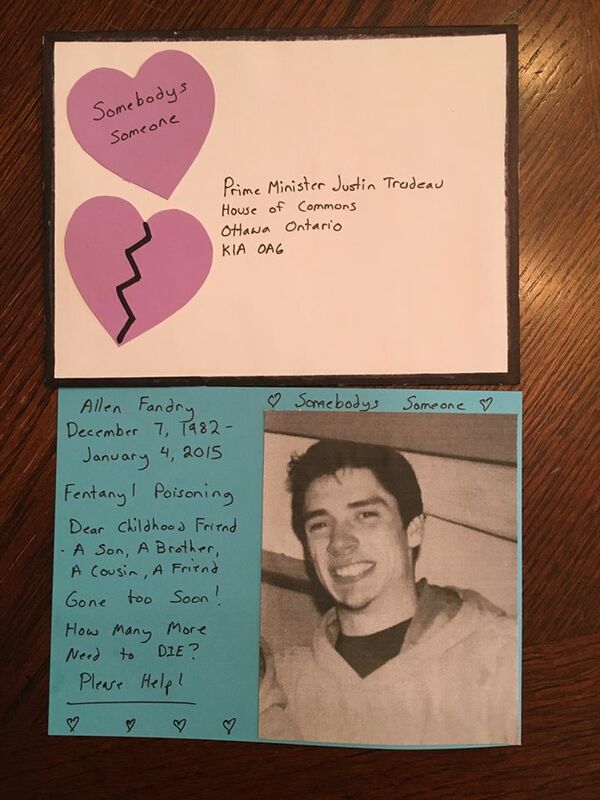 What message does it send when thousands of Canadians die from overdoses and our government fails to seek justice? What does it say when our government refuses even to consider the demonstrated successes of other nations in reducing drug use and deaths? What conclusion are we to draw when our federal government flatly refuses to declare the opioid overdose crisis a national public health emergency - even though provinces have and opioid overdose death is now the number one killer of men between the ages of 30 and 39? We owe it to the memory of those lost to this crisis to hold those who profited to account. We need to stop treating the most vulnerable members of our society like criminals. We need to treat substance use and addiction for what they are: health issues, and social justice issues, not criminal and moral ones. We need significant, new federal money for addiction prevention, education, treatment, and harm reduction - across all modalities, from abstinence to 12 step to opioid substitution, tailored for every demographic, from youth to women to Indigenous Canadians. And treatment must be available as a fully insured service provided by our public health care system so that individuals and families can get timely access at quality facilities regardless of income or ability to pay. My friends – you have felt the pain of substance use like no others. You have experienced the frustration, the powerlessness, the heartache, the grief that only those who have lost a loved one to the disease of addiction can know. I myself lost my father when I was 20 years old to a methadone overdose. I know, feel and share your pain. 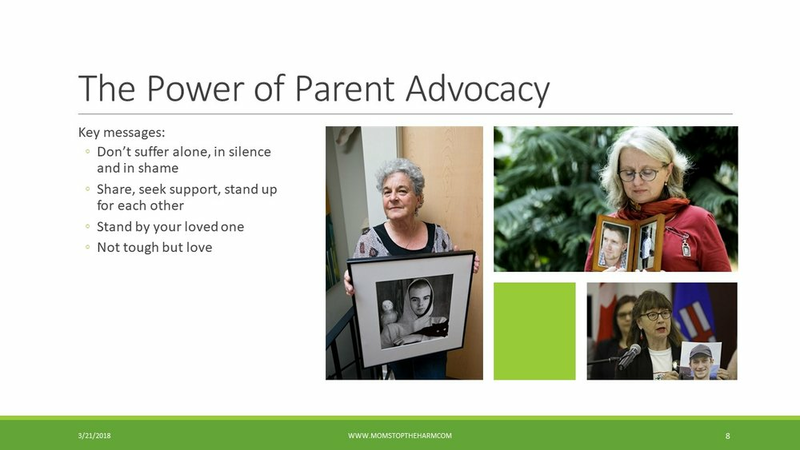 Your courage to show up, to share your experiences, to speak up - to demand more in the knowledge that we can do better - is in service of the greatest legacy we can pay to those we have lost: to do everything in our power to prevent the avoidable, unnecessary death of another mother’s child to addiction. Thank you for your concern for others. Thank you for your commitment to act. Thank you for your willingness to use your pain in service to others. 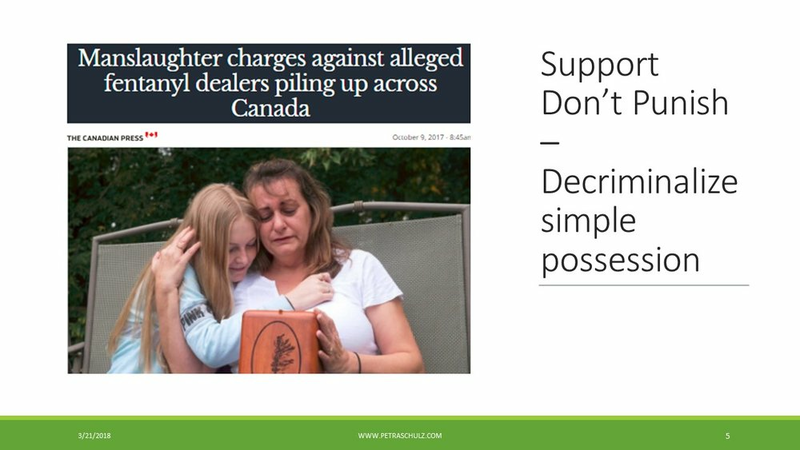 Together – as we just did for cannabis this week – we will prevail in making drug policy in Canada more rational, more effective and more compassionate. We acknowledge in gratitude that our gathering place is within the ancestral, traditional, and unceded territory of the Coast Salish peoples, including the Songhees, the Esquimalt and the Wsanec nations. Before we begin I would like to bring your attention to the Petition to the House of Commons to address the opioid crisis that we urge you to sign – wave your clipboards volunteers. 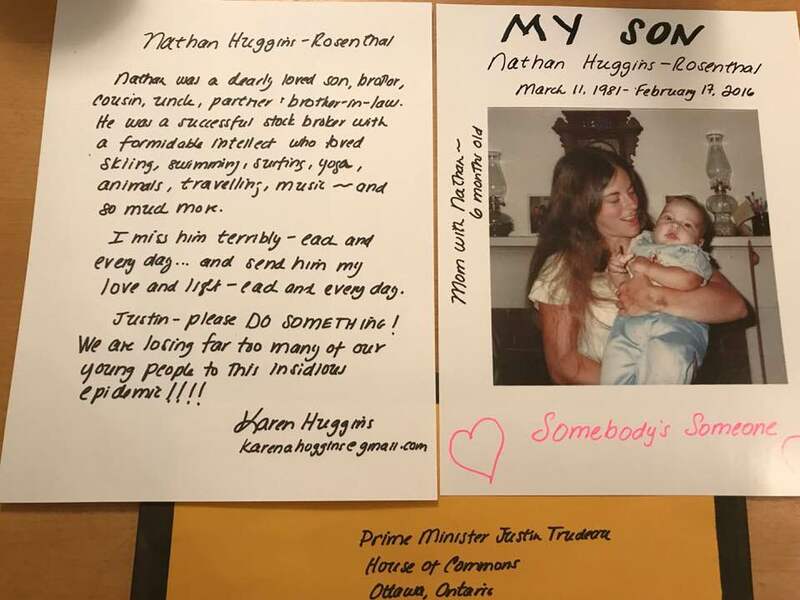 John and Jenifer Hedican of Comox lost their beloved son Ryan to a fentanyl poisoning. They like us are not only grief stricken, they are angry and passionate. Thank you, John and Jennifer, for this petition and its trajectory. We are here to demand that our government and all governments of Canada turn their attention to the fact that there have been over 7000 deaths in 4 years and many before that. These people died of the preventable cause of using illicit, unregulated, and toxic substances. We demand the government place the highest priority on ending the war on drugs, which is a war on the people who use drugs. And specifically, today we ask government to DECRIMINALIZE the people who possess and use illicit drugs. They are not criminals. they are simply using drugs. Drug use must be treated as a social and health-care issue rather than a criminal matter. Many people are addicted to drugs - they take drugs out of a great need, a need that most of cannot fathom unless we’ve been there. Some are seeking a respite from the harshness of their lives. Some are kids looking for a new experience. It is not for the government to literally judge an individual based on what they want or need to take into their own bodies. They are not criminals. In comparison, am I arrested for possessing and drinking alcohol or smoking cigarettes? No! Why not? Because prohibition on alcohol didn’t work in the early 20th century, the government decided that these potentially very harmful substances are legal, and legal to possess and use as unwisely as we like. The Global Commission on Drug Policy, the World Health Organization and both the Canadian and American public health associations support the decriminalization of possessing small quantities of currently illegal psychoactive substances. The countries of Portugal, Argentina, Uruguay, Ecuador, the Netherlands, the Czech republic have all decriminalized drugs. They have shown that such policies free up police and the entire criminal justice system for more serious crimes. These policies send people with addictions toward treatment rather than jail. People who use these drugs are my kid and your kid, your brother, your aunt, your partner and maybe you. They are people who live next door, the people beside you in the parking lot. They are not criminals. They may carry trauma, they may live in poverty, they may have mental health challenges, they may have simply become caught by addiction through a doctor’s prescription. Today we are working on one ask. Decriminalize the possession of and use of illicitly obtained drugs for personal use. It is not a war on drugs that we see, it is a war on the people who use drugs. Let the government, Mr. Trudeau, see that lives will be improved, tax dollars will be saved and put to use in health care, treatment, education, shelters, harm reduction measures. Mr. Trudeau, your party as well as the NDP and the Green Party wants to decriminalize drugs. What IS the problem here? Moms Stop the Harm primarily works to support and keep alive people who use drugs. We want them to be alive, we want every kid who experiments with drugs to live through the experience, we want people who are addicted to have a chance to get to treatment and recovery. We advocate for drug policies that keep users alive and safe. They must not be criminalized, sent to jail, and not treated. They need help not jail. Decriminalize the possession and consumption of all illicit drugs. Decriminalize those who possess and use illicit drugs NOW! Join Moms Stop The Harm (MSTH) in a rally calling for #decriminalizenow and #endthestigma of substance use. MSTH is a network of Canadian families whose loved ones have died due to drug harms or those who hope for recovery. 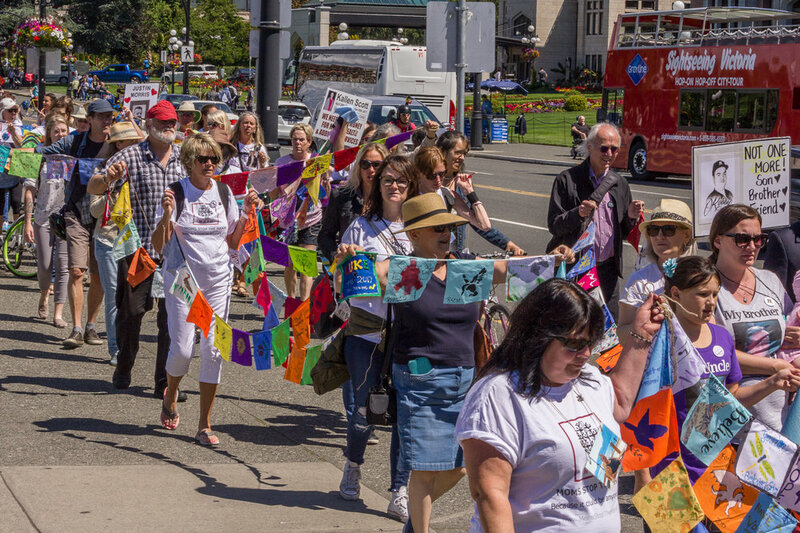 On June 23rd at 12 pm MSTH members and our community allies will be hosting a rally in Victoria, on the steps of the BC Legislature. This rally aims to bring awareness to the harms associated with the criminalization of drug use. Moms Stop The Harm calls for an end to the failed war on drugs. The war on drugs has been a war on drug users and the financial and human cost to society has been staggering. We envision a new approach based on reducing harm, where people who misuse drugs are treated with dignity, respect, compassion, and support. One of the most common themes we have experienced is that most of our loved ones died using alone or with others who were too afraid to call for help. This is one of the driving reasons we are urgently calling on our government for immediate drug policy reform with a focus on decriminalization of the personal possession and use of illicit drugs, and restorative justice rather than criminal justice. Problematic substance use is a health issue and is not resolved through criminalizing personal possession and consumption. Please note: A professional photographer will be attending and taking photos. These images can be supplied to media upon request. What Do Mexican, US and Canadian Moms Want for Mothers Day? On April 5, 2018 the British Columbia government issued a press release stating that it will allow nurse practitioners to prescribe hydromorphone, methadone and suboxone. This progressive public health measure was put forward to save lives in the present opioid drug crisis. This measure is progressive because many Canadians still view those who’ve overdosed or who are at risk of doing so, with a mixture of fear and contempt. For others however, these are our children and the fathers and mothers of our grandchildren. As such, to us they matter. The backdrop to the BC health policy initiative is the shocking number overdoses, many of which involved exposure to the drug fentanyl. There were 982 deaths in BC in 2016, with 67 % involving fentanyl. Approximately 1,422 overdoses occurred in B.C. in 2017 and fentanyl was implicated in 80% of those deaths. In Alberta almost 1.9 people a day died from fentanyl poisoning in 2017. That number is growing. Several people overdosed in Saskatchewan last month. Fentanyl had arrived on the scene. An Ontario MHLTC News Release reported that from July to September 2017, there were 2,449 ER visits for overdose, up from 1,896 in the previous three months. Deaths due to overdoses rose dramatically from 2016 to 2017. Those ambulances you see go whizzing by on their way to an emergency room, people’s children are dying inside them. My child was in one of those ambulances. The Canada Health Agency recently reported that there were over 4,000 overdoses in Canada last year ̶ 1,500 more than in 2016. Advocate Zoe Dodds has referred the crisis as ‘carnage’. Advocate, Vikki Reynolds, referred to it during a workshop I attended as a ‘horror show’. The collective noun for a group of crows is ‘a murder’. I’m going with ‘a massacre’ of overdoses. In 2015 my son’s heart stopped during an overdose. A not uncommon event in these kinds of overdoses. These numbers make it feel like a massacre to me. Fortunately for us, a woman nearby saw and had called 911. She remained with my child and she remains, whoever she is, in my mind. Mothers want more progressive health care initiatives. In 2017 Ian Hanomansing published “If it hasn't happened ... it's coming': Mothers of addicts urge a radical approach to fentanyl crisis.” The article features women speaking about their children’s experiences with drug use. They told their stories in the setting of extreme stigma to illustrate the need for change in our orientation towards those who use drugs. Their message: stop criminalizing drug users and start protecting them instead. They warn people will not stop dying until Canada wakes up. We must learn from those with lived experience, and in particular from youth who’ve survived. They are the experts. We can also learn however from mothers living the crisis. As well, professionals with various forms of real life experience with the crisis, like Leigh Chapman and Zoe Dodd in Toronto, and Vikki Reynolds in BC are working very hard, caring, educating and advocating for others about the opioid crisis that affects all of us. I’m fortunate that Chapman provided us with extremely helpful personal advice by phone. We must listen closely to what these experts say, because too many people are discovering a very hard way that there’s little margin for error. Death can come to your family in an innocuous looking pill. Don’t underestimate the power of peer pressure, if you do not want to learn that your child has died, or is fighting for their life in an ICU, learn from those who have. You can also learn about the crushing effects of stigma. Jettison terms like drug addict and junkie from your vocabulary. Learn about opioid dependence and withdrawal. Find out about ‘harm reduction.’ According to a recent Angus Reid poll, 1 in 8 Canadians (12.5%) know someone who became opioid dependent in the last five years. Yet Statistics Canada’s January 2018 Opioid Awareness Survey found that only about one in fifteen Canadians (7%) know how to access Naloxone and use it to interrupt an overdose until help arrives. Get a Naloxone Kit and ask someone how to use it. Do this, because if you come across someone who has overdosed ̶ and some of you reading this will ̶ they will be relying on you for help. It’s a fact. Be prepared. 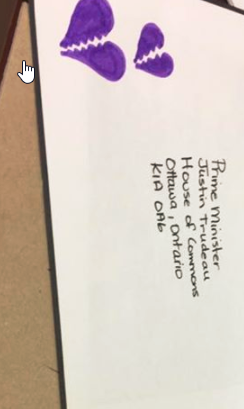 Below is the text of a letter MSTH sent to Prime Minister Justin Trudeau and to Ginette Petitpas Taylor, as well as the response from the Minister of Health. 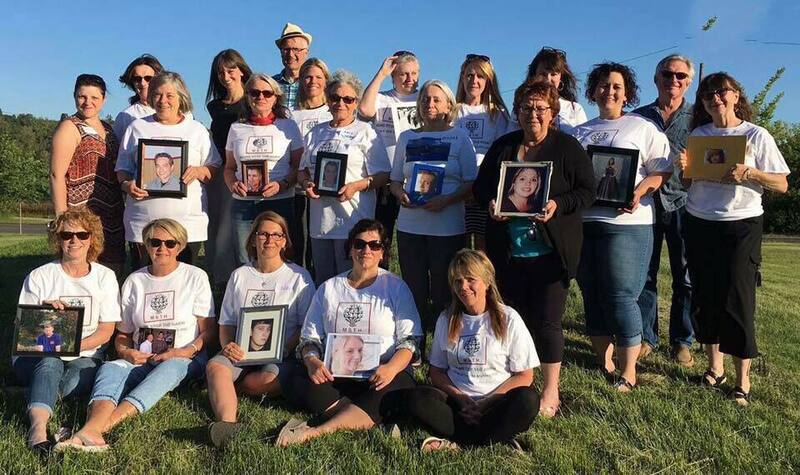 We are writing on behalf of the 350 members of Moms Stop The Harm (www.momstoptheharm.com) whose loved ones have died drug-related deaths, many of which have occurred during the opioid overdose crisis. Members of our advocacy group recently attended Town Hall meetings in Edmonton and Nanaimo. Thank you for hearing our questions and comments about the need for drug policy reform at those two town-hall events, and thank you for offering your condolences on our losses. 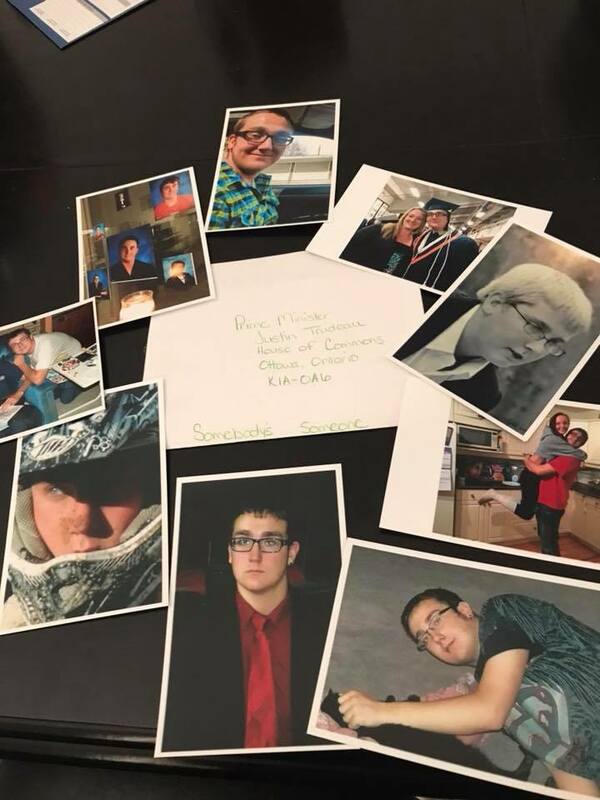 Those who sent letters are all relatives (mothers, fathers, brothers, sisters, uncles, wives, husbands, daughters, sons, cousins) and friends of those who died of drug-related causes. Almost all of the letters that were sent contained cherished photos of our loved ones who have died. 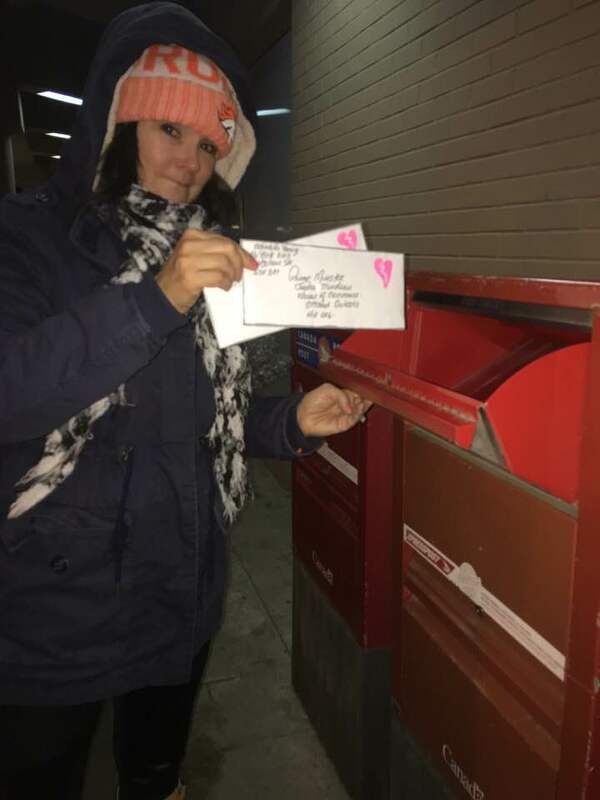 Given the personal nature of the letters and photos that were sent, it is very hurtful to the families that they have not received a response. As MSTH member Patricia Clark states: “This was a very heartfelt campaign and I am very disappointed that my family has not received any response from the Prime Minister.” Another MSTH member stated: “It was hard to do (to send the letter and photo), and my family will echo this, and to be ignored is brutal.” Members of MSTH feel stigmatized because the federal government has failed to contact us after we sent in photos and letters relating to our losses. Now that you know about this letter writing campaign, we are sure you will respond with a letter that we can share with the people who participated in the campaign. We hope your response begins with offering your condolences. Deploy more federal financial investment in responding to the overdose crisis and fund the response at the scale that would be expected for any other public health emergency of this magnitude. However, while it is critical, more than just funding is required. Work with Provinces and Territories and provide leadership to address the lack of training for health care providers in evidence-based addiction treatment that has led to Canada not having a functioning addiction treatment system. Many of the deaths of our loved ones can be directly traced back to the failure of our non-existent addiction treatment system. Leadership at the federal level is needed to push the provinces and territories into establishing evidence-based health care provider education in addiction medicine. This includes the inclusion of addiction medicine in medical student and nursing student curricula, as well as, critically, funding for addiction medicine fellowships so that the expert workforce that does not presently exist will be created in the coming years. Correct the woefully inadequate resources Canada has directed towards action-oriented substance use and addiction research. We want to see the role of research in promoting social change in this controversial area acknowledged through the dramatic scale up of addiction research funding. This could support both responding to the opioid epidemic as well as funds to help address questions related to other drug policy reform needs, including cannabis legalization and the decriminalization of all currently illegal drugs. Here, we strongly recommend following the example of the US National Institutes of Health by creating a substance use-dedicated institute within the Canadian Institutes of Health Research. Many of the services offered for addiction care in Canada are not based on a foundation of research and evidence, and establishing stronger research and knowledge translation capacity will help with needed implementation. Decisions like this make sense from an economic, political and knowledge mobilization perspective and should be made urgently. Create better governance to help organize the response to the overdose crisis. This could be accomplished through the formulation of a federal ministerial council on the opioid crisis. The council could be like the Alberta Ministers Opioid Emergency Response Commission (MOERC) initiated in Alberta in May, 2017 https://www.alberta.ca/albertas-opioid-crisis-response.aspx and draw on the experience of the Ministerial Advisory Council on the Federal Initiative to Address HIV/AIDS in Canada. This new council, focused on the opioid crisis, needs to include people with lived experience and families (including indigenous representation), as well as scholars and practitioners and health officials, who have knowledge of and understand evidence based strategies to address the opioid crisis. The implementation of this Federal Ministerial Council should be announced along with considerable dedicated federal funding. Alberta invested $30 million annually, and we would expect that a federal investment would match this on a per population basis. Such a Council should advise on the allocation of this funding in prevention, treatment, and harm reduction. Provide dedicated resources and provide instruction to provinces and territories to establish family advocacy and support groups and peer-support groups. People directly affected by the opioid crisis, including people who use drugs and family members affected by substance use or addiction, are best positioned to identify and help implement solutions. These groups have not been well supported or acknowledged. The need for federal action in this area is urgent. Act now on drug policy reform. After years of inaction by the previous government regarding drug policy reform, we are encouraged by recent changes that your Liberal government has implemented including: passing the Good Samaritan Act, approving supervised consumption services across the country, supporting the piloting of drug checking initiatives, and initiating a national anti-stigma and education campaign. We are also encouraged that Liberal MPs are hoping to adopt a priority resolution at the Liberal Party of Canada’s policy convention that would direct the federal government to eliminate criminal penalties for simple possession and consumption of all illicit drugs. The decriminalization of the possession of small amounts of drugs for personal use is urgently needed. Substance use disorder is not a moral failing. It is a health issue that requires treatment and continued support, rather than a criminal justice approach, an approach taken by Portugal, Switzerland and soon Norway and the State of Oregon. We look forward to hearing from you as soon as possible. 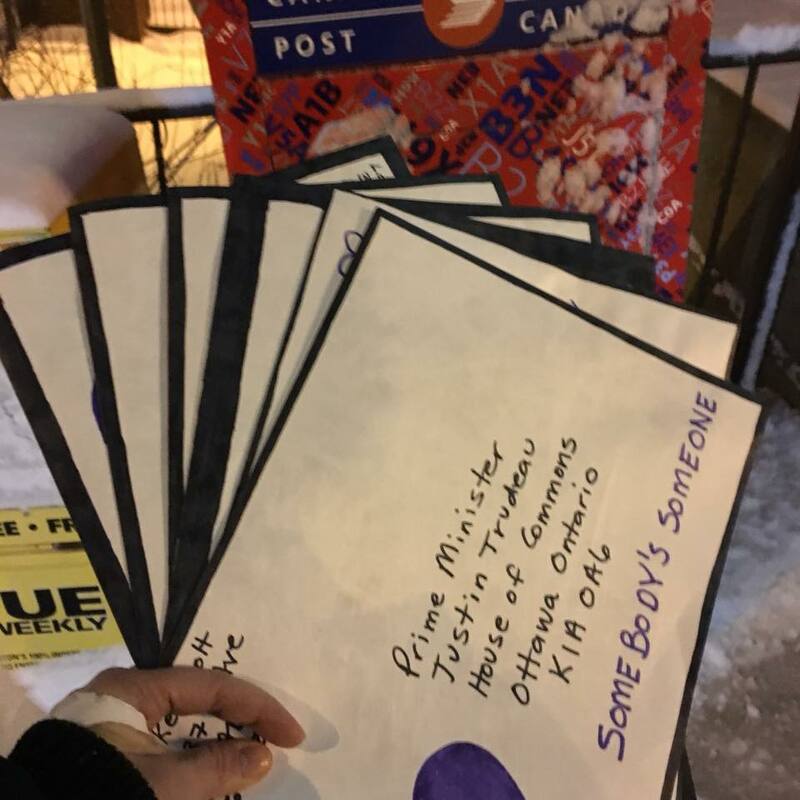 The families who sent those 400 letters are waiting for a response that will acknowledge their losses and provide information to them about the next steps the Federal government is taking to address the opioid overdose crisis. We also formally request the opportunity to meet with you and you team to hear directly how we can mobilize support for the implementation of the above initiatives. Thank you in advance for your consideration of this request. Co-founders. Moms Stop The Harm. Cc: Linda Duncan, MP; Elisabeth May, MP; Don Davis, MP; Ginette Ginette Petitpas Taylor, Minister of Health; Suzy McDonald, Deputy Minister of of Health, BCCSU. Petra was invited to present to the Law Enforement Round Table in Ottawa on March 19, 2018. The presentation given was a slightly abbreviated version from the text below. Our youngest child Danny died from accidental drug poisoning in 2014. Danny was 25 years old. Danny was in recovery when one more pill, which he thought was a fake OxyContin, but was in fact Fentanyl, took his life. We did not know about the increased risk in recovery, when the person’s tolerance for the drug is lowered and when they are less informed about the scene and dangerous drugs. He was one of the early victims, before Fentanyl made the news, and before there were any health warnings. Those came several months after his death. After Danny died we decided to be open about the cause of his death. We wanted to end the silence and the stigma. Friends and family, and his workplace were surprised. Danny did not look like an “addict” - a word I don’t care for much. How does a person who struggles with substance use look like? In most cases, it is an invisible condition. When Danny died, he had been in recovery for a year and a half. He was a chef in one of Edmonton’s best restaurants, and he lived in a downtown apartment. What worked for Danny was opioid agonist treatment with Methadone combined with counselling, which we paid for privately. The only thing the public health system offered at the time was a list of 12 step groups, that are not evidence based and would not have taken him on methadone. What did not work was the fact that both he and we were keen to have him “drug free” and he did not stay on the Methadone long enough to be stable. For a while it seemed that we had the old Danny back, the kid we knew before he became dependant on drugs. On the outside, he looked like a successful young man, but he was struggling. His addiction started as his way of dealing with his severe social anxiety, but there were other risk factors: A learning disability, being gay, working in an environment were drug use is prevalent. Being impulsive and risk seeking. He told me once that after he took an opioid he could just walk into any room and be himself, and I wondered if being yourself is too much to ask. Should we not help people to deal with their mental health issues, before they turn to drugs? What I have since learned is that one of the greatest barrier to providing more effective supports is the stigma of mental health and substance use. It is because of stigma that people, like Danny, use and die alone. 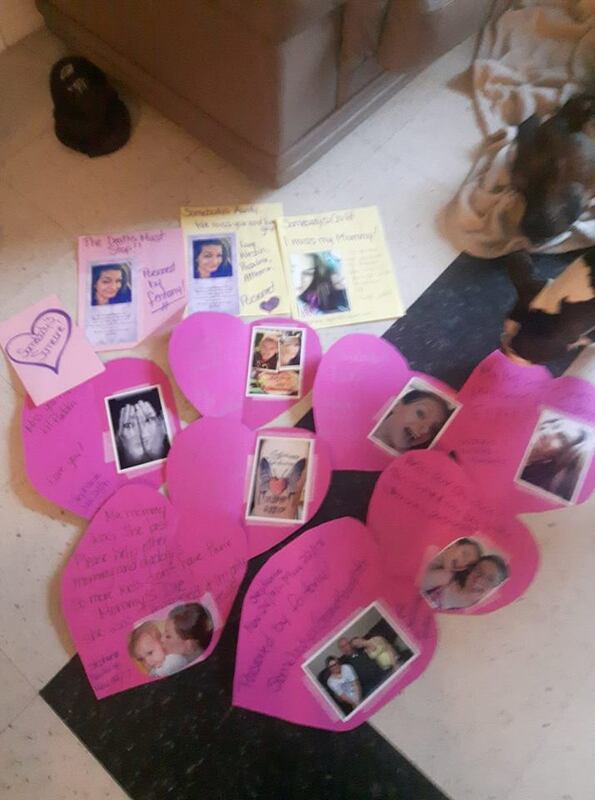 These are the photos of some of the loved ones MSTH members mourn. The images we see in the media are mostly from Vancouver’s DTES – of people who are living with multiple risk factors besides substance use. These individuals been underserved for a long time and an effect of this crisis is the fact that this population finally gets attention and services, such as supervised injection. The reasons why people use vary widely, but there are some common themes, especially for those where the use becomes problematic: physical or mental pain (mental health), trauma and adverse childhood experiences (ACEs), and a lack of hope. For many sexual exploitation causes and contributes to use. In Canada this is slowly changing, but people are dying faster than we can respond, and our response to date does not match the magnitude of the crisis. All too often the focus of information for parents and users is still to get “clean” - another term I don’t care for much. People relapse and we did not learn about potential lifesaving solutions, such as Naloxone and how opioid agonist treatment should work, until it was too late. Danny was as safety conscious as he could be, doing something very dangerous. He always bought new needles, but that day he was home alone, so nobody could assist him when he overdosed. I can’t tell you how many times I imagine myself finding him in time with a Naloxone kit in hand - I always keep one with me now. I can visualize what I would have done, but never got a chance to do. Before his death we had never heard of Naloxone, a safe medication that can reverse an opioid overdose, if administered in time. Anybody who takes drugs from the illicit market, including those who do so casually and even those who take prescription opioids should have Naloxone on hand, and make sure that their friends and family know how to use it. Ideally you should not use drugs alone, but if you must, always let others know and never take them in a place where you can’t be found, such as stairways or locked cubicles in public washrooms. We have mothers in our group whose children were found in those locations after it was too late. These rules are like basic first aid, more important since the arrival of new and more toxic drugs, such as Fentanyl, and Carfentanil. Before Fentanyl, the people who were most at risk were people like Danny, injection drug users dependant on opioids. For casual users, the situation has drastically changed, as Fentanyl and other toxic substances are contaminating drugs that should not contain an opioid, such as cocaine, methamphetamine and ecstasy. Contrary to common assumptions not all drug use is problematic, and most people who use substances do so without developing an addiction. I had a glass of wine last night and I will be ok tonight if I go without one. What substances are currently legal, such as alcohol and Cigarettes and soon cannabis, and what is illegal is not always based on evidence. Alcohol is dangerous and causes tremendous harm, such as family violence, and motor vehicle collisions, as well as a host of potentially fatal health conditions. How drugs are regulated should be based on the best possible evidence on their harm and with a population health approach. Using substances is as old as the human race and, some people will always use. Does arresting dealers help keep us safe and save lives? Some dealers, who are part of large criminal networks, yes, but the street-level dealer who is a user needs a different, more creative and compassionate approach. If more arrests and stricter punishment would keep us safer, the US would be one of the safest countries. Why do people deal? Many of our children who used have also been involved in trafficking, mostly to finance their use, or to pay back dealer debt. People who use have also told us that the street level dealer who uses has a safety role, as they can advise on the strength and/or toxicity of a batch. You probably know of the turf wars that erupt when a dealer is taken out. As a society, we need a paradigm shift away from treating substance use as a criminal justice problem, to approaching it as a health and human rights issue. Our mothers group calls for the decriminalization of the personal possession of illicit drugs. This is a big shift for Canadian society and probably for many of you, but it has been shown to save lives and reduce crime in several European countries, where it is practised. Since decriminalization in Portugal, rates of drug use have not increased, far fewer people arrested and incarcerated for drugs, more people receive drug treatment, and incidence of HIV/AIDS, as well as drug-induced deaths have been significantly reduced. How can we expect people to seek help for doing something that could result in a life altering criminal record? For those within the criminal justice system we need to provide harm reduction (needle exchanges or naloxone), and evidence based treatment and effective follow-up services for substance use disorder (SUD) when the person is released. Loved ones of our members have overdosed in or right out of jail. Their tolerance is lowered and the addiction has not been addressed. Locking people up for using drugs causes tremendous harm to the individuals, their families and to society, while it does nothing to help those in need of treatment nor to reduce the supply of illicit drugs. This young woman is was in recovery when she died in 2017. She did not die from the drug use itself, but from endocarditis, caused by the dirty needles she shared and repeatedly used. She did not have access to a needle exchange, and the city where she lived still does not offer supervised injection services. If she would have had access to both, she would not have had to die. Prohibitive drug policies based on the false assumption that needle exchanges and supervised consumption encourages drug use, are causing harm. These services keep people as healthy as possible and data from BC shows that those who have access to SCS are 30% more likely to seek addictions treatment. This young woman's ultimate cause of death should read bad drug policy. The picture on the right is a vile o OxyNeo. When it be became clear that we were duped by Purdue pharma regarding their claims of the “non-addictive & slow acting” properties of Oxycontin, and when the extend of the misuse and addiction attributed to prescription medication, Oxycontin was reformulated into a “tamper proof version” and rebranded at OxyNeo. But users were left stranded. Nobody thought to combine the measures that influenced the supply with measure that addressed demand. When you are dependant on opioids you don’t just stop to take them because your supply has changed. Opioid dependence is a chronic condition and people need medical help to stop using. Criminal networks quickly filled the void left with the reformulation with drugs that are easy to smuggle and can be sold with a huge profit. Poorly planned and executed drug policy brought us fentanyl and other synthetic drugs. Danny’s substance use started on prescription Oxycontin, readily available on the streets of Edmonton, and ended with a fatal dose of fentanyl. People do recover from substance use if we use evidence based (proven) treatment approaches, combined with harm reduction measures to keep them alive. Some people simply outgrow their dependence when they mature or life circumstance changes. Our expectations of recovery have to change. These photos are from the SALOME study in Vancouver, where individuals, who have not succeeded with other treatment approaches, have access to injectable prescription hydromorphone. The results have been amazing and the stabilizing effect in people’s life is evident. Without having to seek the illegal fix, people found housing, work, reconnected with loved ones, and most importantly have found hope for the future, some have moved to OAT or even stopped using. People I know take a daily dose of Methadone or Suboxone, but you would never know. It is part of their health regime, just like some people take blood pressure meds or insulin. Recovery does not have to mean to be or drug free. Recovery means being free from the chase of buying drugs on the street and all the activities that come with getting the money to do so. Activities that keep you busy. For some people it may mean drug free, but making “clean” the benchmark has cost the lives of many people for whom this was an unrealistic goal. In my advocacy work I am always amazed at the time, creative energy and a money spent on keeping people safe from a toxic illicit drug supply. Would it not be so much easier if giving safe drugs on prescription, to those who are addicted, could be a first line of defence rather than a last resort? Living with substance use disorder should not have to come with a risk of sudden death. Danny came close to reaching recovery. He had hopes and dreams. He is on our mind every day and I try to think about the loving, caring son he was and the great meals he cooked. I can’t help to also think about how different the outcome could have been. Personal Safety – setting healthy boundaries, protecting the child who is using, other children and the rest of the family, personal threats from dealers over debt, dealing with sexual exploitation. Social isolation from family and peers due to stigma – Before Danny died not even his grandparents new about his addiciton. As you have heard drug policy has four distinct pillars : prevention, treatment, harm reduction and enforcement. Your concern is the fourth pillar, but if we do not invest in the other 3, we will not be successful and you are not able to do your job effectively. I would like to quote Sargent Jason Walker, one of my fellow members from the AB MOERC, who works for Calgary Police services: He has learned that “We can’t arrest ourselves out of this problem”. We have to look for solutions in the other 3 pillars. As mothers and families we want to keep our loved ones alive and as healthy as possible until they can arrive at a place in their lives where treatment or abstinence works for them. Please help us achieve that outcome! In closing, I would like to share this final message to you: When a person with SUD presents in to you, remember how hard it is come forward and ask for help. Welcome them, thank them, and be kind. Watch not only your words but also your body language. Check the person’s knowledge of harm reduction. Do they know that all pills and power may contain Fentanyl? Do they know not to use alone, but to have a safe observer? Do you and your loved ones have Naloxone? Most of all welcome the person, tell them that you are glad they are here and help keep them alive. Someone’s mom will thank you for it. Welcome to 2018, the year when more people will die from causes related to substance use in Canada than ever. When I wished my family and friends a happy New Year last night it was with a heavy heart. 2018 is the third year that begins without our youngest son Danny, and the first year for over 4000 Canadian families who lost a loved one to an overdose or other causes related to substance use in 2017. How do I know that 2018 will be worse? I follow provincial (Alberta, British Columbia) and federal overdose surveillance reports on fatal overdoses and the reported trend is sharply upward. The users, advocates and front-line workers in my social media and personal networks have also seen significant increases in deaths. 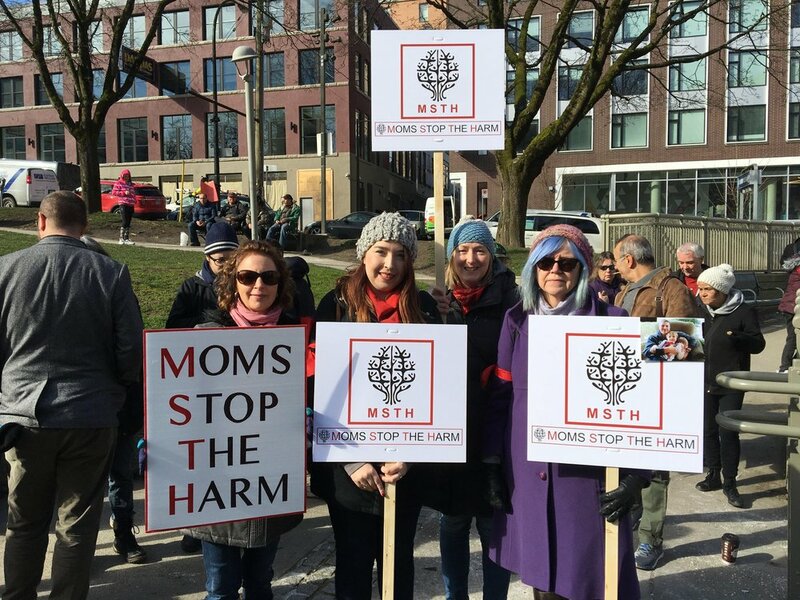 Every day more families join Moms Stop the Harm (MSTH). Most organizations would view growth from 3 founding members (Lorna Thomas, Leslie McBain and I) in May 2016 to over 300 members in December 2017 as a success, but in our case every new submission via our website comes with a story of desperation, fear, and pain. Desperation and fear for those who have a loved one struggling with substance use and the extreme pain of the newly bereaved. Too many times this year we received a cry for help from a family who do not know where to get treatment for a child, or how to deal with the loss of someone who had so much promise and their entire life ahead of them. The stories are so familiar showing bright young faces from all walks of life, backgrounds and regions of the county. We have seen progress over the past year: more supervised consumption sites have been approved; peer and volunteer lead overdose prevention sites can soon operate legally; and Naloxone (an antidote that can reverse the effect of an overdose) is being distributed more widely in BC, Alberta, and Ontario. Access to treatment is improving and innovative treatment approaches, such as rapid access programs in emergency rooms and the provision of safe drugs, are being implemented. Several provinces and the federal government are developing anti-stigma campaigns, and the federal government has made funding available through its Substance Use and Addictions Program and other initiatives. Why do people continue to die despite this progress? There is not one clear answer to this complex question, but part of the answer is that the federal government, provincial and territorial health care providers let the crisis get out of hand before taking action and the response has not been commensurate with its magnitude. Have we ever had 4000 people die from a disease or other health condition without a comprehensive national strategy? Many of the measures taken to date , such as supervised consumption and overdose prevention sites, are most effective for people who are homeless or unstably housed. Data from the BC Coroners Service, released in October 2017, shows that 87% of overdoses occur indoors, often in people’s homes (59%) and presumably when people use alone. These at-risk users include casual users and those who have developed an addiction. Casual users seem to be most at risk, as they have not developed a tolerance for opioids and they may be unaware that other drugs are contaminated with fentanyl (tests at Insite in Vancouver show that around 80% of all street drugs contain a synthetic opioid, such as Fentanyl). Most casual users do not know how to recognize and respond to an overdose. According to a CBC News report from Winnipeg a young man who died when he and his friends shared pills they thought were Oxycontin. His friends and his brother thought he was “sleeping it off” when he was in fact dying from an overdose. One of the greatest barriers to addressing the problem is the stigma that surrounds substance use, which causes both casual users and those who live with an addiction to hide their use, including by using alone. When people use alone, no one is there to help when they overdose, like our son Danny who we found dead in his apartment in downtown Edmonton, in walking distance to one of the approved supervised injection services. Distributing Naloxone will not help if people use in secret and alone as they cannot administer Naloxone on themselves. Even effective anti-stigma campaigns will not fully eliminate the misconception of the person who uses substances as someone who lacks willpower and has a problem that is entirely self-inflicted. Problematic substance use is still seen as a moral failing and not as a health issue. What would it take to prove my dire perdiction wrong and reverse the deadly trend? Instead of a patchwork of federal and provincial initiatives, a clear and coordinated national strategy with levels of investment at least equal (per person) to those made during the AIDS crisis in the 1980s—when half as many people died in peak years as did in the opioid crisis in 2017 alone —is required. Such a strategy should be guided by people with lived experience, affected families, and be based on the best available evidence. This evidence tells us that we need to stop criminalizing substance use and start investing in prevention, treatment, and harm reduction as Portugal has done and Norway plans to do. Portugal has since reduced its overdose rate to 6 deaths per million of population, while the US is at 185. Canadian data from March 2017 shows 78 per million nationally, however, the hardest hit provinces and territories are much higher: BC's rate is 200 per million, the Yukon at 160 and Alberta at 138. These rates are not adjusted for year end numbers. As the experience of European countries shows, decriminalizing the possession of drugs for personal use will help end the stigmatization of substance use and allow users to come forward and seek help through harm reduction measures and treatment. Decriminalization will also permit an open discussion about substance use that will lead to truly innovative approaches and more research findings. Decriminalization is a bold step that our current government has been unwilling to take. In our most recent campaign we have asked Prime Minister Justin Trudeau to “Do Something”, starting with acknowledging the magnitude of the opioid crisis and initiating a national strategy. 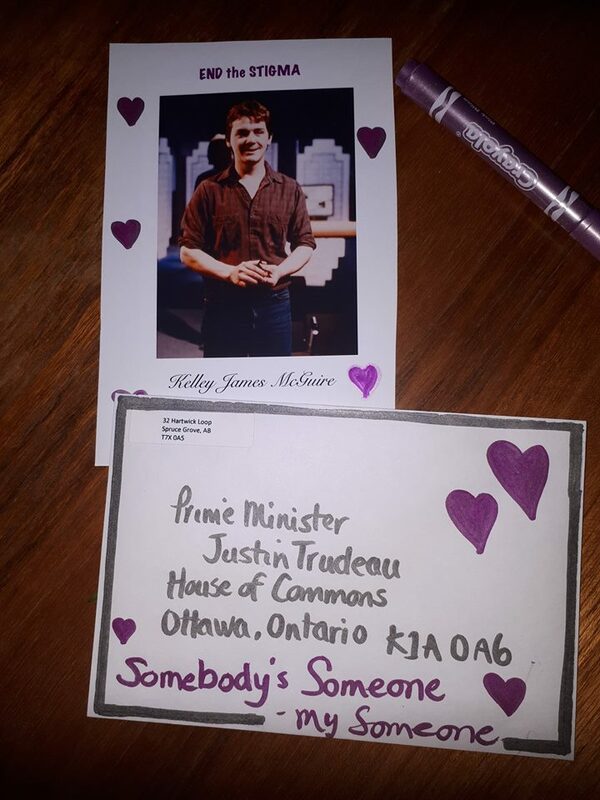 So far, he has not responded to hundreds of Canadian families who have sent photos of loved ones who have died or purple hearts for individuals who are struggling. His silence is deafening and a slap in the face of those who have suffered so much. As a society we should not accept the deaths of thousands of Canadians in the prime of their lives as the new normal. As families we will not be silent and stand by while our loved ones die from preventable causes. We should not have to start the New Year without our sons, daughters, brothers, fathers, mothers, relatives, and friends. Individuals struggling with substances use have a right to access appropriate medical services and deserve the same level of support and care offered to those with other health conditions. We call on the Prime Minister, and all levels of government, to “Do Something”, to match investment in this crisis to its magnitude and to take the bold step of decriminalizing the possession of drugs for personal use. See results of our follow-up survey below campaign photos. 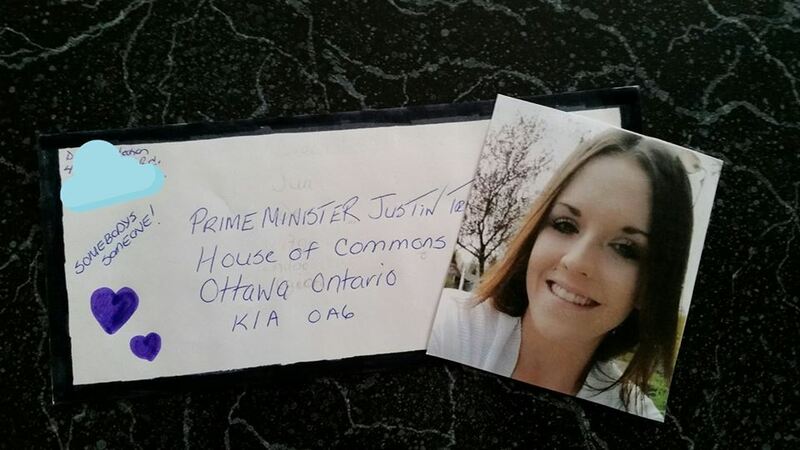 More than 450 photos were sent to the Prime Minister, who so far has not replied to anyone. We have all been feeling the pain of the rising death toll in the opioid crisis, as numbers of families in mourning grow. The actions of all levels of government are inadequate considering the magnitude of the problem. We need to see leadership at the top, starting with our prime minister, Justin Trudeau. 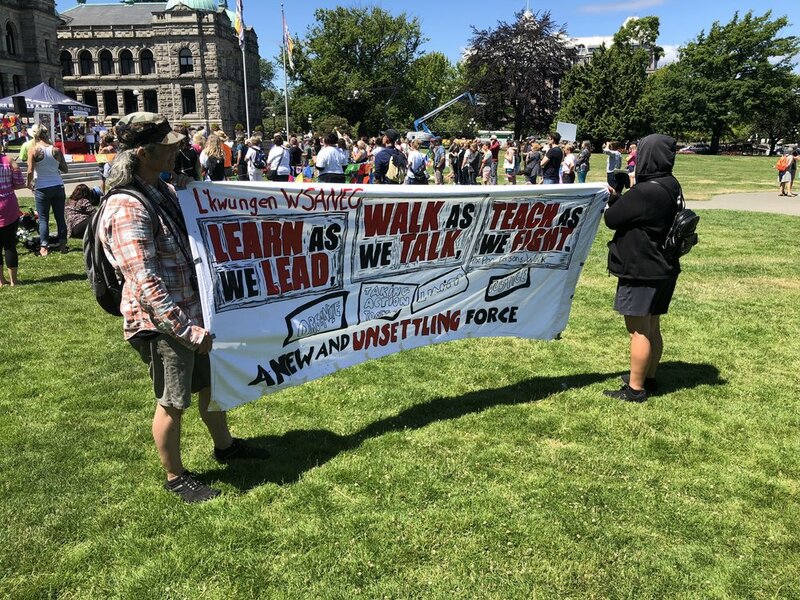 Over the past months he has spoken on a number of issues, but has been relatively silent regarding this crisis and did not cover this topic at all at town halls this summer, that some MSTH members had a chance to attend. If you do not have a photo cut out a purple heart from construction paper and proceed. Also use a purple heart if you are sending on behalf of a person with living experience. their name [NOTE: If you are not able to use the actual name, chose a name, every person counts]; and the year they were born and the year they died. Use a regular envelope and write your return address on the envelope. You may also add that to the photo, so you can get a reply from the PM office. Please take a photo of your project and post it to one of our Facebook pages or email to Petra Schulz, so we can add the photo here. Feel free to share this as widely as possible! 3. Got good media coverage which in turn may influence public education and understanding, empathy. 5. disappointed that there has been no response from the PM office yet. 6. Campaign focused specifically on opioids/fentanyl. Could have included other drugs such as cocaine, meth, crack, ecstasy…given that a good number of the loved ones of MSTH members did not use opioids. 7. The campaign could have included images of those loved ones who are still alive and in recovery, not just those who have died. 8. 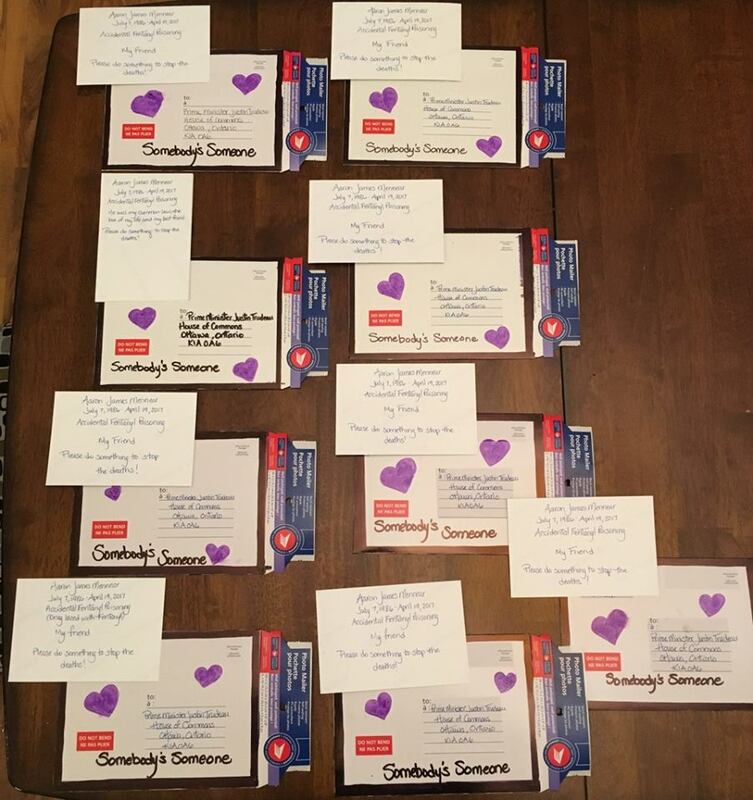 A person who has worked on advocacy campaigns advised that putting the hearts on the outside of the envelopes was a mistake. Those receiving the letters might have just put them all in one pile and not opened them (yet). The assumption should be that if they (the person(s) receiving the messages) were aware, surely they would be doing something about it. 1. Keep up the pressure on the office of the Prime Minister and send the key message(s) c/c to others such as Health Minister, MPs. --anti stigma education for front line workers. --have bereaved parents speak to youth groups. 4. A Campaign directed at Provinces, Members of Legislature given the Provinces have a lot of say in where Health dollars are spent. -increase understanding the addiction is a health issue. Why are so many people dying? What needs to happen to stop it? It is difficult in this complex crisis to know which way to go first. But as Moms Stop The Harm (MSTH) has always stated, first, we need to save lives. We know that a dead drug user will never recover. And we know the solutions. Why are people dying? Simple - it is the toxic black-market drug supply. Why does that black market exist? Because of the money and because of bad drug policy that drives people into the black market. How do we rid ourselves of the major part of the black market? Supply safe drugs to those with substance use disorder (people living with addiction). How do we provide safe drugs in the face of a federal government that refuses to consider decriminalization and regulation? We look at the Crosstown Clinic in Vancouver as an example. How do we encourage those with substance use disorder to go into effective and proven treatment? Provide multi path, low barrier, rapid access treatments combined with housing first strategies for those who are unstably housed. We must build the system and ensure that it works. Provide connection, empathy and humane treatment to those people addicted to drugs. Sadly providing connection, conversation, and anti stigma community dialogue will have little impact on the death rates without the previous steps (safe supply and rapid low barrier access to effective treatment). I know people will say, 'but we can only do what we can do”. True, but with courage, and passion, we can push the envelope. We must begin to think out of the box immediately. As the CAPUD (The Canadian Association of People Who Use Drugs) says: #theytalkwedie. It is a slogan that comes to my mind every day. Our actions must be guided by what is most important. First we have to stop the drug related deaths. We need to get naloxone on in the hand of every drug user, train people on the street, in bars, in educational institutions and every environment where people may be at risk in regular, widely advertised sessions in public places. Provide targeted intense messaging about not using alone, knowing about overdose and how to respond, and about the 911 emergency law. Saves lives and then look at housing and access to treatment. Sorry to rant, but it is very frustrating to hear more talk, more research, more indirect, soft solutions to the overdose epidemic. In Canada more than 2,816 people died of a drug overdose in 2016, almost 1000 in BC alone. We must put our energies where they will make an immediate impact. Only the government bodies can provide the infrastructure. It comes down to creative thinking, courage, and funding! But first and foremost, we must save the lives of everyone's children. I would like to start first and foremost by acknowledging that we are gathering here today on treaty 6 territory on which out of respect for the land and its people must be honored and respected. For those of you who don’t know me my name is Shanell Twan I am a proud member of AAWEAR [Alberta Addicts Who Educate And Advocate Responsibily] which is one of the co- host Organizations for today’s event. We are Gathered here today FOR International Overdose Awareness day and to Acknowledge That We fight for those we love and have lost. The harms being caused by the war on drugs can no longer be ignored – so we are calling for more humane drug policies that support, and don’t punish, people who use substances. It is time to leave behind the harmful politics, ideologies and prejudices – and prioritize the health and welfare of those affected. I am here today as a concerned Albertan and an indigenous woman who values the recent truth and reconciliation events that happened across our country. I believe it is time for us to reconcile with the truth and i feel that one of my truths is that as indigenous people we are often overrepresented in a variety of systems: the legal and justice systems, health care, and social service systems. I find it disheartening that substance use has long been viewed as a criminal and moral issue rather than a health issue. In reality, it is an unpleasant fact that has touched many families. Mine included. I feel it is here that a tectonic shift must take place…treating someone who uses substances must be seen as a bonified health issue. Because I currently see a disconnect between all systems with class and race often playing a role in how we view substance use or addiction. I feel that people who use substances should be viewed as just that people rather than offenders. Law enforcement and public health should have the same goal of wanting people to do good and stay alive to make a different choice on another day. We are desperately in need of supervised injection services to help decrease the high number of overdoses we are seeing in communities across our country. When substances are used inside of a health setting and substance use becomes decriminalized people then come into contact with nurses, social and peer support workers that are there to provide them with voluntary drug tapering strategies, education, advocacy, health and social interventions available to them if they so choose. I see a valuable opportunity for us to take a stand on the forefront of this overdose crisis, and provide people using substances with services that will prevent further loss of life due to overdose. Because as it was said in Ottawa at the Canadian drug future forum: ’’the drug supply in Canada has gone toxic’’! We should all know by now that we cannot arrest our way out of this crisis. We know that mental health factors contribute to substance use and that mental health sufferers are twice as likely to use substances that being said i feel that we need to look around the country and maybe even the world to see what’s working well and look at applying some of those ideas here and now (coughs-like Portugal’s model). Because the death toll rise in spite of current actions and at best a glacial pace is what things seem to be moving forward at. What evidence based things can we look too… where other interventions have failed heroin assisted therapy has had great successes Portugal even greater successes. At ungass2016- 22 governments from around the world advocated for all drug decriminalization here is a small part of a statement from the idpc- international drug policy consortium-…” the gold standard of decriminalization is the removal of all punishment for drug use and the provision of voluntary health and social services ’’the sad reality is our current drug laws and policies have failed us. I believe herein lies an opportunity for us to show some leadership. We need to show good models and then scale them up building an evidence base that demonstrates what works safely and effectively to save lives …because the government doesn’t hold all the answers and neither do we. This is why evidence must form the basis of all policies in place. I feel that we are at a crossroads where I think we must acquire the knowledge to build upon societal support to expand upon these services. I urge you to push pass ideology, prejudice, and fear to step up to help our citizens. Let’s roll up sleeve take bold steps and help people, so no more families have to lose a mother, a father, a son, a daughter, a sister or brother. Or in my family’s case an aunt and two cousins. We need our governments to make evidence based decisions when it comes to drug policies. We need progressive evidence based policies. We need you to take the ideology out of it and only make evidence based decisions. I do believe we need an integrative knowledge exchange about best practices from across our country, and maybe even the world, we need support from all levels of government to help build upon this knowledge base so we may integrate and facilitate the effective use of this knowledge into practice. To the provincial & federal government i implore you. The evidence is there use it!! End the War on Drugs. In the short-term, decriminalize possession of all drugs. In the long term, full legalization and regulation of drugs. Create a specific harm reduction initiative as part of the new Canadian Drugs and Substances Strategy, to support, expand and adequately fund harm reduction programs and strategies including explicit funding for the development of drug user-based organizations and advocacy groups. Remove barriers and increase access to opioid substitution therapy including access to prescription heroin. We should be identifying smart policies and implementing them to apply solutions to save lives. I can honestly tell you the vast majority of deaths I am seeing are related to illicit drugs, Fentanyl and Carfentenyl, and now even cocaine and methamphetamine can contain these. I can also honestly tell you that i have attended numerous funerals in the past few months. And i am now at a point where I have to acknowledge my own personal experiences with tackling issues related to my own mental health, because as of lately I feel as though I’ve been plagued by depression. Thoughts and memories of those we’ve lost leave me holding on to hope, hoping those who hold the power can and will do something to help. Now is the time to remember, it is also the time to act! Manitoba MSTH leaders Chris Dobbs and Arlene Kolb were invited to attend a meeting with the Federal Minister of Health Jane Philpott in Winnipeg on July 22, 2017. Here is Chris Dobbs' summary of the event. With over 30 people in attendance the moms nervously waited their turn to speak to the Minister. Arlene started with a question: "You want to know what I want? I want my son back! All I have is his hat, and his ashes, I smell his hat everyday to be close to him", as she picks up the hat and smells it.....peoples eyes welled up with tears. She stated clearly that we need to stop the stigma and we need treatment. I then spoke about Adam and who he was, and that he was not his addiction. I talked about our lack of resources and how shameful it is that we have no medical detox or no protocol for our Doctors and emergency health services, no protocol to really help those suffering with the disease of opiate addiction. I went on to read a letter my son wrote, a letter begging me to help him and not give up on him, and that he was scared. Not a dry eye in the house. I questioned whether anyone would put their child in the Main Street project, the only available place to detox. A place filled with both people addicted to alcohol and those addicted to drugs. You bunk up with six others, all sick and one was even a drug dealer. Everyone shook their heads. I also asked Max Waddell, from Winnipeg Police Service, as he spoke to picking up persons who are overdosing, what happens to them, what do you do with them? All they can do is take them to ER, check them send them on their way. I asked Minister Geortzen about the recent approval of suboxone and what Doctors are administering it. He admitted that this is a problem, getting Doctors trained to work with suboxone . Lastly, I related my own experience of 14 years ago, a heart attack. I mentioned that we have protocols and I was treated immediately, given medicines, monitored in hospital for a week, sent to rehabilitation, counselling and follow up every six months which continues to this day! We need protocols to treat people dependant on substances who seeking help. They should not be treated differently than anyone else in the health system. 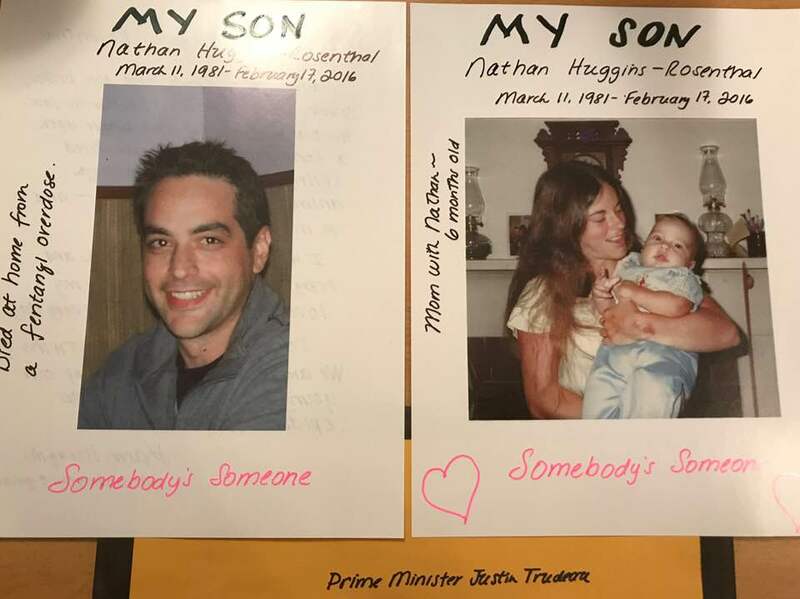 Minister Jane Philpott in the centre and next to her, holding photos of their sons, are Arlene Kolb and Chris Dobbs.